Natural pearls are extremely rare. In fact, only about 1 in 10,000 oysters will produce a pearl. Of these, only a small percentage will achieve the size, shape, and color of a desirable gemstone. In addition, about 9 to 11 pounds of natural pearls are discovered for every 2,000 tons of freshwater mussel shells harvested to be used as nuclei in the cultured pearl market. It is estimated that one to two out of 1000 natural pearls will be round, in contrast to one in 10-50 bead nucleated cultured pearls. Throughout history, the pearl has been one of the most highly prized sought-after gems. The ancient Egyptians prized pearls so much they were buried with them. Cleopatra reportedly dissolved single pearls in a glass of wine and drank it, simply to win a wager with Mark Antony that she could consume the wealth of an entire nation in just one meal. Until the early 1900's, natural pearls were accessible only to the rich and famous. In 1916, famed French jeweler Jacques Cartier bought his landmark store on New York's famous Fifth Avenue by trading two natural pearl necklaces for the valuable property. Today, the most expensive pearls are large natural pearls. Wealthy people were willing to pay more for natural pearls for their history and mystique. Currently, natural pearls cater to a special segment of people who truly value the finest of all things, they appreciate and admire the rare beauty of a natural pearl. Natural pearls are not judged by cultured pearls standards. they generally will not be as large as today's cultured pearls. Any one natural pearl in a matched strand will command 40 to 60 percent more than a cultured pearl of comparable quality. Their history not only makes up for their smallness, but also adds to their allure, which is why natural pearl lovers will go to great lengths to find them. Cultivating natural pearls requires patience, as well. A 4mm natural pearl can take an oyster upwards of 6 years to produce! A natural pearl forms when an irritant gets inside the oyster’s shell. To protect its delicate body from the irritant, the pearl secretes a substance called nacre to surround the irritant. The oyster never stops secreting nacre, so over the years the nacre layers build up to form a genuine pearl, composed entirely of nacre without human intervention of any kind. The traditional source of natural pearls, one of the oldest of all recognized gems, is the area around the Persian Gulf or the Gulf of Manaar in Sri Lanka. That is why they are sometimes referred to as Oriental pearls. A cultured pearl begins when a rounded piece of mother-of-pearl shell along with a speck of mantle tissue is carefully placed inside an oyster. To soothe itself, the oyster forms a coating called nacre around the nucleus and continues to coat it with layers of nacre over the next several years. There are two main types of cultured pearls on the market today: Akoya and Freshwater. 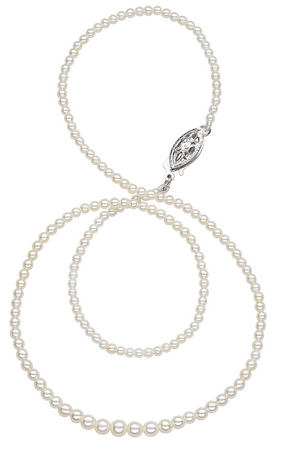 Originally native to Japan, Akoya pearls are recognized around the world as the classic cultured pearl. They are the most beautiful and lustrous of all cultured pearls due to their consistent roundness and bright reflective luster. Akoya pearls are bead-nucleated and generally one pearl at a time can be grown. According to the Cultured Pearl Association of America (CPAA), Japanese Akoya Cultured pearls "are the most lustrous of all pearls found anywhere in the world. In recent years, China has been successful in producing Akoya pearls within their own waters. However,at this time they are unable to produce as brilliant a luster as high quality as Japanese Akoya cultured pearls." The Japanese waters in which Akoya pearls grow are considerably cooler, 10 to 15 degrees cooler, than those grown in warmer climates, where other types of saltwater cultured pearls are grown. The cooler conditions cause Akoya pearls to develop their nacre coating more slowly, and with a more compact crystal structure. This is what increases Akoya pearls' reflective and refractive qualities. Akoya pearls are the world's most popular cultured pearls. 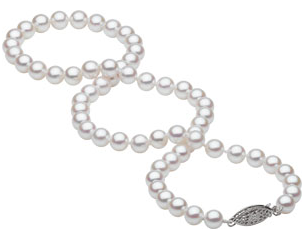 It is widely believed that Akoya pearls have the highest luster of all cultured pearls. That is why they’re the only cultured pearls that Add-A-Pearl® sells. Freshwater pearls can be found in bays and rivers throughout the world. They are easily cultivated from freshwater mollusks in China, Japan and the U.S.
Freshwater pearls are grown within mussels. Within each host, ten to fourteen pearls can be harvested at once. Therefore, the outcomes are often unpredictable. Additionally, freshwater pearls will form with a lower amount of organic material in their nacre resulting in a glassier luster. Although some freshwater pearls may appear similar to Akoya pearls, when examined closely the differences are visible. Akoya pearls are much smoother, rounder and more lustrous than freshwater pearls.